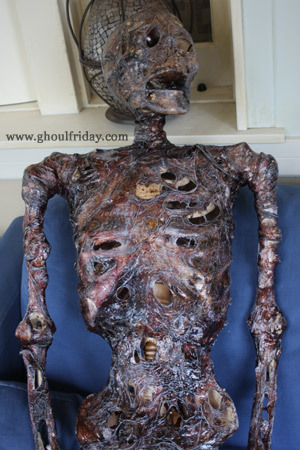 Ghoul Friday has an excellent tutorial on turning an off the shelf Halloween skeleton into a realistic rotted corpse. They guide uses the heat gun and plastic wrap technique and includes detailed looks at each step of the process. Part One of the tutorial covers the physical prep of the skeleton, while Part Two is the final finishing process. Ghoul Friday does some fantastic work. Glad you found her and decided to feature one of her how-to's. This project has been done by several people but I like all the additional details and steps she takes to go beyond some others. I also have a few of her art pieces. But what I've discovered is that just about any material can be made to look convincing with enough paint, washes and drybrushing.